Valspar Bonding Primer is a one-step primer and sealer coat for difficult surfaces, both porous and glossy. This primer is exceedingly thick, making it difficult to handle, so use sparingly. But the product's thickness is inescapable since most bonding primers rely on thick viscosity to help paint adhere to ordinary surfaces like drywall and problem surfaces like metal and plastic. Bonding primers are also the way to begin if you intend to paint melamine, tile, or laminate. This bonding primer is thick and will handle almost any kind of material. Compared to other bonding primers, this Valspar product is less expensive than many. It adheres to and seals glossy surfaces with no need for sanding. Because of its viscosity, this Valspar product can be difficult to spread, roll, and brush. No longer found at Lowe's Home Improvement stores, this product is not widely available. One gallon covers between 200 and 400 square feet. As a low odor, low VOC product, it is not noxious to work with. It is available in both 1-gallon and 5-gallon sizes. Besides a surface preparation, the product is also designed to block stains and cover up knot holes in wood. Because it is a latex primer, it washes up with warm water. After the product has completely dried, it is sandable down to a smooth surface suitable for painting. This primer can be used on brick, natural stone, veneer stone, new and old drywall, plaster, bare wood, painted wood, wood paneling, PVC, all types of metal including aluminum, ceramic tile, porcelain tile, glass, and some weathered paint. Though this product can cover up many issues on a surface, all mildew must first be completely removed. If you are accustomed only to working with acrylic-latex paint, this product operates generally the same way with a few exceptions to account for its thickness. First, stir the product with a drill and mixer instead of with a wooden stirring stick. This is necessary to pull up the solids from the bottom of the can. Use only a high-quality, sturdy roller and a medium-nap (3/8-inch to 1/2-inch) roller cover. When using a brush, opt for a polyester brush, rather than horse hair. Valspar Stain-Blocking Bonding Primer can be used with an airless sprayer at 2,000 PSI with a standard 0.015–inch to 0.021-inch size tip. 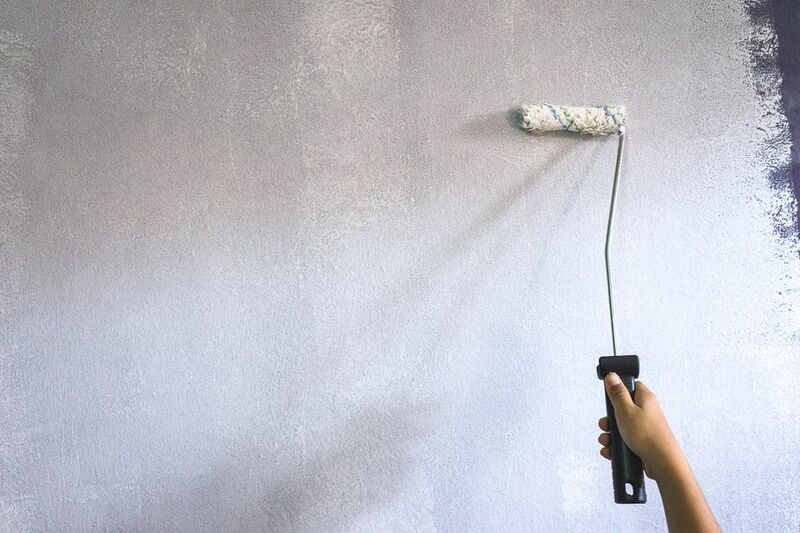 Even though Valspar Bonding Primer can cover limited amounts of dust and debris, it is still best to clean the surface as thoroughly as possible and then let it dry. Especially dusty and chalky surfaces should be cleaned, as well as those that are greasy, oily, and waxy. Remove all peeling paint. Since this product can stick to glossy surfaces, you do not need to sand them. Cover nail holes with wood putty and caulk cracks and joints. Clean all mildew with a solution of 1 part liquid chlorine bleach to 3 parts of water, then rinse clean. Pour the product in a roller tray, then lightly dab the roller cover in the product. If using a brush, load the brush lightly on the tips of the bristles. Apply in one coat. Run warm, soapy water across brushes, rollers, and other equipment. Use a paint comb to comb out the water from brushes, shake dry, then hang for further drying. Because the Valspar Bonding Primer dries especially thick and hard, it will gum up the paint can near the lid. So be especially sure to clean up the can's grooved top before tightly replacing the lid. If you are tired of priming and re-priming, then a bonding primer may be what you need. When you've got an argumentative surface such as knotty or tannin-releasing wood, slick glass or metal, or even weathered paint on wood, you need what's called a bonding primer. This primer bonds especially well to highly porous and otherwise poor surfaces because, physically, it lays on and stays on like a thick plastic blanket. This is a one-coat primer you can apply to almost anything prior to painting. Keep in mind that you pay the price for this by having to deal with its very thick consistency. But this is typical for any of these one-step, thick primers, Masterchem's KILZ being Valspar's most prominent competitor. Bonding primer is often touted as the miracle subsurface for porous surfaces like weathered wood or masonry because its thickness bridges cellular spaces. But for those who need to paint slick items like laminate, melamine cabinets, glass tile, ceramic or porcelain tile, a bonding primer is the only way to begin.